THIS is the first look at the bike that will replace the bog-standard Bonneville in Triumph’s line-up later this year, joining the new T120, Thruxton and Street Twin in Triumph's water-cooled Modern Classics range. At the moment, the old-model Bonneville T100 remains on sale as the mid-range offering, costing £7,799, or £7,599 for the ‘Black’ version, vs £7,300 for the all-new, water-cooled Street Twin. But its days are numbered as it lacks the anti-lock brakes and Euro4 emissions certification that it would need to remain on sale in 2017, so before the year is out it’s set to be replaced by the bike you see here. 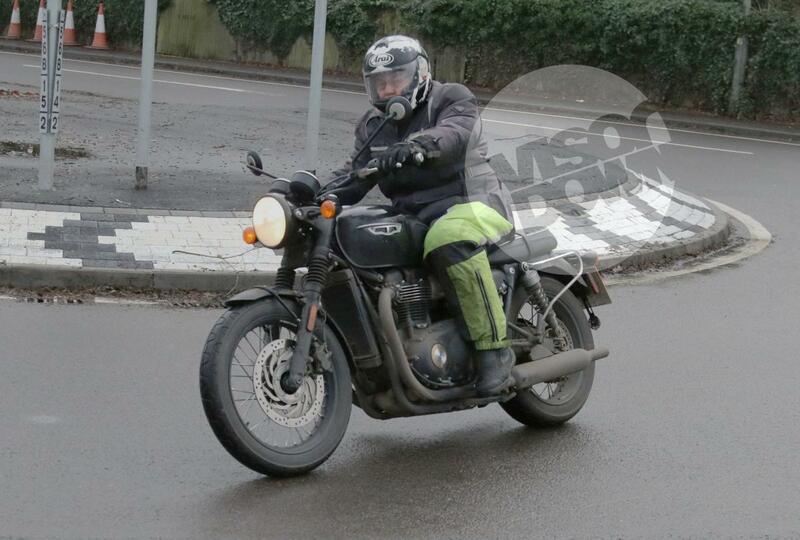 Visually the machine in the spy shot is near-identical to the new Bonneville T120, but while that bike features a 1200cc water-cooled twin and is expected to be significantly pricier than the old Bonneville at around £9,500, the model seen here is expected to be nearer £8,000-£8,500. Its main change is the adoption of the Street Twin’s 900cc version of the new parallel twin, along with the Street Twin’s forks and single front disc brake in place of the faster T120’s twin discs. Look closely and it’s just possible to make out the ‘900’ badge on the engine. It also appears to lack the T120’s distinctive throttle bodies, which are cast to resemble traditional carburettors. The Street Twin’s single throttle doesn’t have such adornment, and neither does this prototype. While the 900 engine of the Street Twin is actually down on power compared to the old air-cooled Bonnie, with 54hp compared to 68hp, it’s got much more torque (59lbft at 3,230rpm compared to 50lbft at 5,800rpm.) There’s also the possibility that it will be retuned for more power in this application, since the Street Twin version is clearly not stretched to the limits of its potential. The bike seen here is clearly a hard-used prototype; the left-hand side panel is broken and the thick layer of grime suggests it’s getting plenty of testing miles under its belt. The passenger grab rail of the T120 is also notably absent, although that might be a result of pannier brackets having been fitted at some stage to carry testing gear, rather than a characteristic that will carry though to production. We’d expect the new bike to be launched sometime this summer, ready to go on sale by the end of the year.